I found it instore. It is currently £46 on Amazon. Great christmas present for a Lego fan. If you can't find it and need more blocks, get the Kreo boxes instead. It's compatible with lego and a 700 piece box is about £12-£15. So that's £90 for 4500 pieces. Suddenly my Death Star seems overpriced. Managed to get one a couple weeks ago. Very good size for the money. Bought this with my online Tesco grocery shopping last week. Used £12 discount voucher. If you can't find it and need more blocks, get the Kreo boxes instead. … If you can't find it and need more blocks, get the Kreo boxes instead. 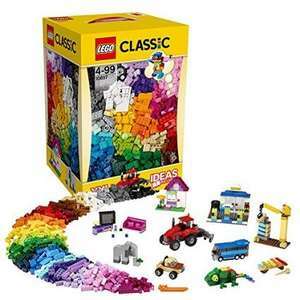 It's compatible with lego and a 700 piece box is about £12-£15. ​lol that's not the same.. it's like saying don't buy Russian standard vodka, Happy shopper will do..
Bought this with my online Tesco grocery shopping last week. Used £12 … Bought this with my online Tesco grocery shopping last week. Used £12 discount voucher. where did you get discount voucher if I may ask? My groceries are delivered from Stevenage Extra store. I probably ordered the last one because the XXL Lego box became unavailable/OOS after my groceries & Lego was picked. You won't be able to build a Death Star with the box of pieces though (or at least anything that looks as good as the actual Death Star set).